A portrait of a triumphant Seve Ballesteros was a fitting backdrop as Reeve Whitson posed with the Spanish Amateur Championship trophy at La Manga. 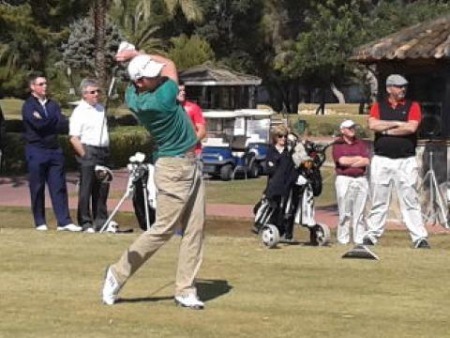 Picture courtesy twitter.com/gmacespanyaReeve Whitson followed in the footsteps of Darren Clarke 23 years ago when won the Spanish International Amateur Championship to earn his place in next month’s Spanish Open on the European Tour. The 21-year old from the Mourne club in Newcastle, a son of long-serving Royal County Down professional Kevan, beat England’s Neil Raymond 4 and 3 in the 36-hole final under leaden Spanish skies at La Manga’s South Course. 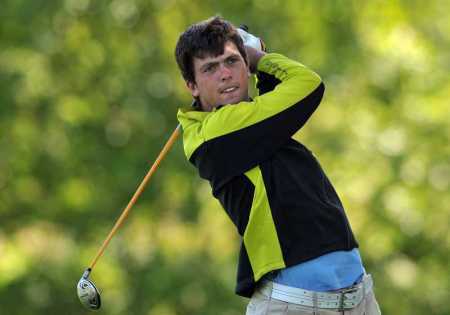 Having dispensed with world No 32 Adrien Saddier of France in the semi-finals on Saturday afternoon, Whitson was one down after nine holes of the morning round but won the 10th with a birdie and was never headed from the moment he took a one up lead at the par-five 13th. Two up after the morning round, he eventually chiseled out an impressive victory that earns him a place in the Spanish Open at El Saler from April 18-21. After getting up and down for a half in par at the 21st, he found water with his second shot at the par-five fourth and conceded the hole to see his lead cut to just one hole. With the wind becoming a factor, Raymond flew the par-five sixth green with his third and a two-putt par was good enough to restore Whitson’s two up lunchtime lead. He then won the par-four seventh in par to go three up and with the par-five ninth halved in birdie fours, Whitson closed out the match through the toughest stretch on the course. A winning par at the 11th put him four up with seven to go and Raymond had to hole a testing five-footer just to halve the short 12th in par. Moving on to the long, par-five 13th, both players’ tee-shots were carried off on the wind into the trees on the right. Whitson could only play out sideways and the Englishman threaded an excellent long iron to within wedge distance. According to Golf Links Spain, Whitson was forced to go for the green from about 250 yards, but pulled his third shot out of bounds and conceded the hole to see his lead reduced to three up with five to play. Whitson knocked his second to within easy chipping distance and as Raymond chipped to five feet in four, calmly stroked in his 10 foot par putt for the match and the title. 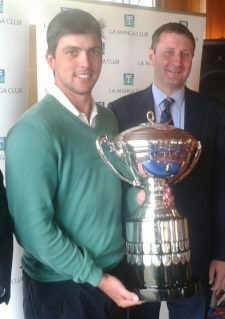 The Ulster player was presented with the prestigious King’s Cup, joining José María Olazábal (1983 and 1984), Doneraile’s Michael Quirke (1987), Clarke (1990) and Sergio García (1998) on the list champions and break into the top 100 in the World Amateur Golf Ranking. Reeve Whitson, Gary Hurley and Niall Gorey are through to the matchplay stages of the Australian Amateur Open at Woodlands Golf Club (above).Reeve Whitson was the top Irish qualifier for the matchplay stage of the Australian Amateur Open Championship at Woodlands and Huntingdale Golf Club in Melbourne. Reeve Whitson made a good start in the Lake Macquarie Amateur in Australia. Picture by Pat Cashman (courtesy Golfing Union of Ireland/www.gui.ie)Richard O’Donovan (70) and Reeve Whitson (71) made steady starts at the Lake Macquarie Amateur Open Championship in Belmont. 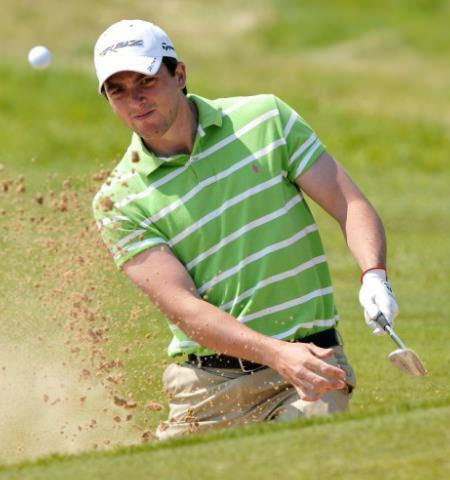 Reeve Whitson will tee it up in the quarter-finals of the Spanish Amateur at La Manga. Picture: Pat CashmanReeve Whitson cruised into the quarter-finals of the Spanish Amateur Open thanks to a brace of impressive victories at La Manga. Reeve Whitson in action at La Manga on Saturday. Picture courtesy https://twitter.com/gmacespanyaMourne’s Reeve Whitson put on a sensational show to cruise into the final of the Spanish Amateur Open Championship at La Manga.